I have seen people selling these Emblems for the 76-79 Monza Spyder. They say they are fender Emblems but I have never seen them on any Monza. The first time I saw them I thought it was mistake and they were really for the 60's Corvair Monza Spyder but since then I have seen them a few times stating they are for the h body Monza's. Were they used on the h body's and if so what years and were they actually fender Emblems or was it a dash emblem? The part number for these are listed for a 1976-79 Monza. When introduced in 76 the Z01 Spyder package was a performance suspension package that included those emblems on the fenders and the Spyder emblems on the front only if a coupe (only in 76 coupe you get a Spyder coupe) and front and rear if a hatchback and the steering wheel emblem. In 77 a separate Z02 Spyder appearance package became available which included the stripes. When the Z02 option was ordered the Spyder fender scripts were deleted. In 77 the spoilers also became available. monzaaddict wrote: When introduced in 76 the Z01 Spyder package was a performance suspension package that included those emblems on the fenders and the Spyder emblems on the front only if a coupe (only in 76 coupe you get a Spyder coupe) and front and rear if a hatchback and the steering wheel emblem. In 77 a separate Z02 Spyder appearance package became available which included the stripes. When the Z02 option was ordered the Spyder fender scripts were deleted. In 77 the spoilers also became available. Right on, my new '76 had the Spyder package as well as the badges even though it was a 140 4 Cylinder with a T50 5-speed. One more emblem question. I'm going to be building a clone of a, (or as close as possible), stock 79 Monza Spyder (quad h/l hatchback) with the 5.0 Liter V8. Over the years of sourcing parts for it I have acquired NOS or very very nice slightly used Monza and Spyder emblems. My question is: Would a 79 Monza Spyder with the 5.0 Liter V8 have the small Monza fender emblems on it? I have the Monza grill emblem, the 5.0 Liter badges, the front and rear Spyder Emblems all in NOS, a very nice original Spyder Emblem horn button off my 1980 Spyder and a few very nice Monza fender emblems. I have seen lots of pictures and some cars have the Monza fender emblems on them and some don't. I'm unsure if they should have them and some people have removed them or if some years had them and some did not. If anyone could clarify that for me, I would greatly appreciate it. 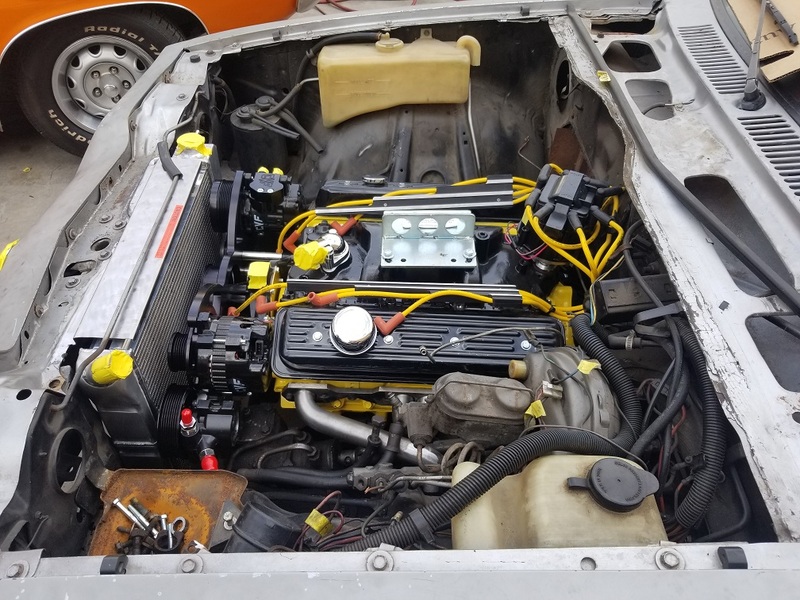 Just trying to make the car as close as possible to what a factory 79 Monza Spyder with the 5.0 Liter V8 should have looked like the day it rolled off the assembly line. See the attached pic's one has the emblem and one does not. Ha, I just noticed that both of those cars have the large front spoiler on them that I thought was only used on the 1980 Spyder's. I am I right or wrong with the spoiler? I had planned all along to use the large front spoiler as I have the one off my 1980 and I just like the look of that spoiler but now I'm wondering if it was used on the 1979 as well? Not that it matters but the only three deviations from stock that I planned on doing was the large front spoiler, dual exhaust and I still have the chrome 13" mag wheels I bought for my 1980 way back in 1984 and I bought a new set of the BFG RWL 205/60R 13's to go on them. Stock right down to all the engine accessory brackets, pulleys, fan, air cleaner etc. Anyway if anyone can confirm one way or the other it would be nice to know. thanks. 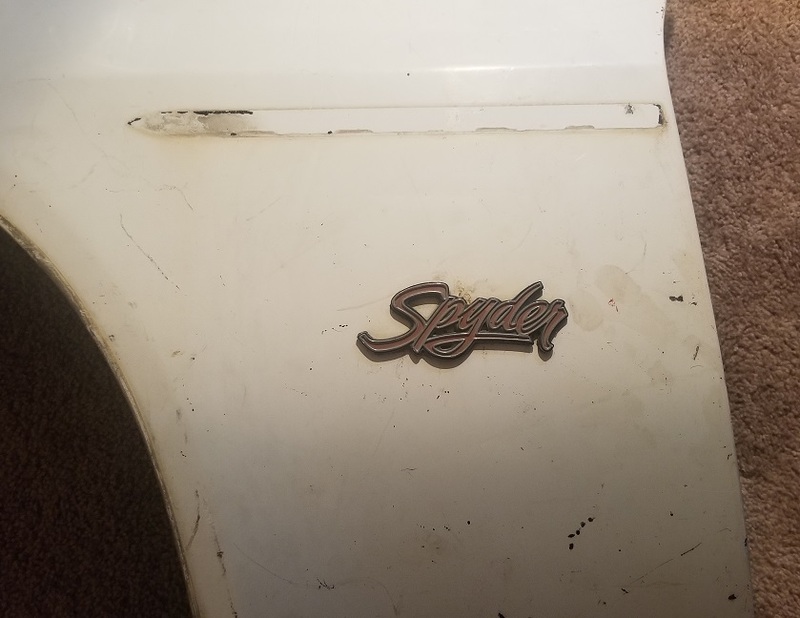 My 79 Spyder had those Spyder script emblems. I've still got the fenders and plan to put the emblems on my 80 when I get around to doing the body work. Hi Brian, so those fenders were off a 79 quad h/l hatchback factory Spyder? Did you own it since new? 79MonzaSpyder wrote: Hi Brian, so those fenders were off a 79 quad h/l hatchback factory Spyder? Did you own it since new? Nope. Bought it back in 2014 from a gentleman in Iowa. It has since been completely stripped and most of the parts from it are in storage waiting to be used for repairs on my '80 Spyder. The panels in that picture have since been media blasted and electrostatic primered and are waiting to replace the ones on my car now. Here's a pic of the white 79 Spyder with the fenders intact alongside an 80 2+2 that has also been completely stripped out. The remains of both cars went to a local yard when I moved from Nebraska to Arizona. So you still have the shell of the 80 2+2 and the parts off the 79 rebuild the 80 2+2? What power plant do you have planned for it? Looks like a 79 would have had the "monza" script on the fenders only if the spyder package wasn't ordered... With Z01 only it would have had those spyder scripts alone as seen on the car above, and with the decals there was no script. As far as the dual exhaust goes, the V8s would have had a dual tail pipe set up, so you could mimic the factory outlets to give it that stock look if desired. Good luck. Hope to see some pics of the project. 79MonzaSpyder wrote: So you still have the shell of the 80 2+2 and the parts off the 79 rebuild the 80 2+2? What power plant do you have planned for it? No, sorry. The remains of both cars went to a local yard when I moved from Nebraska to Arizona. Since we would be moving into an apartment I wouldn't have the storage capacity for two full shells. So, instead I stripped them of everything I would need then purchased a running/driving 1980 Spyder from one of the members here and had it shipped to AZ. Since then I have had the 4 speed rebuilt and the four cylinder replaced with a 350 built to my specifications by Phoenix Engine. 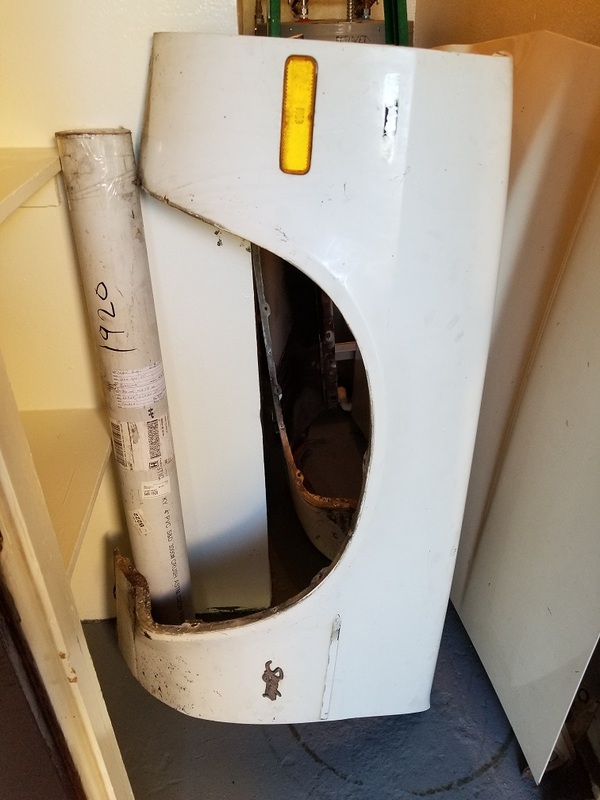 More details can be found in this thread but here's a couple pictures and a video. Unfortunately, since I am currently unemployed, the build is going to stay where it's at for now until I can start saving some money again. Then I plan to upgrade the brakes and do the five lug conversion and then complete the AC installation (driving that car with no AC is rough in the summer). Eventually the body/paint work and interior will get their turns as well. Marco, thanks for the clarification. When I start the Monza I will be starting a project journal on the forum. I wasn't aware the V8's had a dual tailpipe setup. 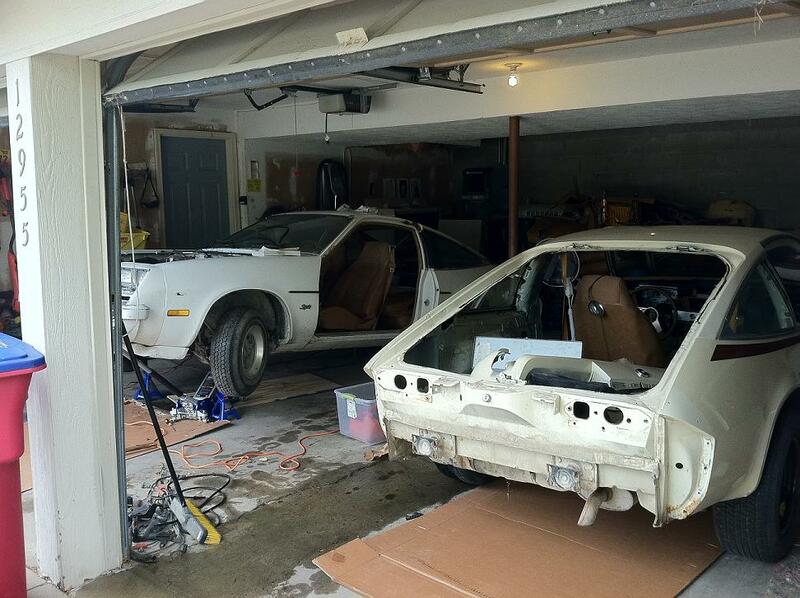 I'm just finishing up a square body restoration and then I'm starting the Monza. 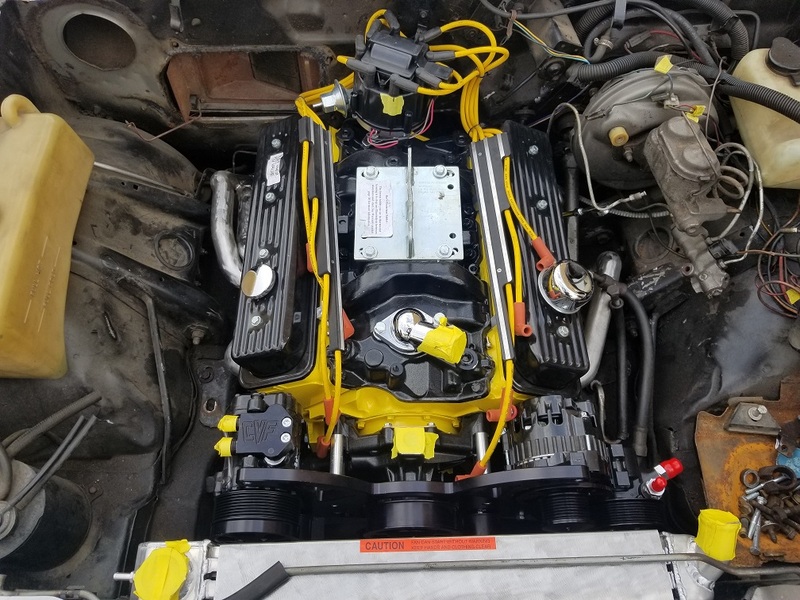 I've owned the square body since 1984 and one Monza since 1985, (made a type o earlier in this post and said I had the monza since 1984, it was actually 1985), and the Monza build car since 2004. And Brian, I didn't make the connection until now but I have read your thread on your build. I will keep watching your build and good luck with the job hunting.